I would like to know if it's a myth, because I feel something evolutionary in me that tells me simply mixing it back into the water is a bad idea. There is no scientific reason at all to assume that such a method is safe, certainly not for any random pickle made by any random recipe spoiled by any random white mold found in any random environment. While some very acidic pickling liquids might kill the mold or bacteria, it will not deactivate existing aflatoxins or bacterial toxins. Well, let's start from the top. You mentioned "Jam and Pickles," but these are actually two very different environments for the growth of things like molds and bacteria. Some people have already mentioned that you might be seeing something other than mold. If it IS mold, the USDA recommendation is to chuck it due to potential mycotoxins. The USDA actually has a lovely table drawn up of recommendations for what to keep and what to toss when you do see actual mold in your food. Personally, I recommend following the USDA's guidelines on eating (or more generally, not eating) food with mold. This doesn't mean I always do so myself (often if it's just a very small spot, I get annoyed and end up carefully scooping it out, even knowing I shouldn't), but it's what I'd be comfortable recommending to someone else. Honestly there's enough other ways to get food poisoning that are risky but may be deemed worth pursuing for achieving something you can't really get without taking that risk (and, ideally, ways to help mitigate those risks, like deep freezing with sushi, etc); I'm not really sure trying to not throw away some jam is one of them. Granted, the picture doesn't look like mold to me, and I would tend to agree with the other comments regarding the picture in question likely being pectin or crystallization but it's honestly hard for me to tell for sure from that particular image, personally. Obviously, when talking about pickles, you shouldn't be seeing pectin on the surface. But what you might see with a pickling process that can sometimes be mistaken for mold is yeast! Kahm yeast, to be precise, is a somewhat common pickling issue when things don't quite go perfectly. If it is Kahm yeast, it's considered harmless. Still, most places recommend scooping it out as much as possible (within reason) rather than mixing it back in. Not because it's going to hurt you, but because it will affect the flavor if you stir it back in. So that seems to be another point against the "always just mix it back in!" myth, if we start from the assumption that it formed based mostly on the mistaken identity of things like Kahm that aren't actually mold. Mold usually distinguishes itself by appearing "fuzzy" (growing up from the surface a bit with fuzzy tendrils) as well as growing tendrils into whatever it is growing on/in (often these are not very visible, depending on the stage of growth, which is another reason to throw certain things out when they get mold infested, because it will be more than just on the surface). Kahm yeast, on the other hand, is usually described as looking like a relatively flat coating (that may have bubbles or ridges formed under it due to the fermentation process). Kahm yeast is always translucent (depending on thickness) white to light cream in color. Thicker cultures of Kahm yeast may appear less "flat" and more rough, but the basic principle still applies: it's not "fuzzy" like mold. I did actually find one interesting picture that shows the growth of some mold on top of a culture of Kahm. 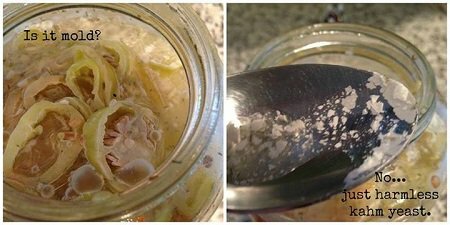 …and not just some part of your jam separating out or Kahm yeast growing on your pickles, then no, stirring it back in is about the last thing you would ever want to do. If the mold is creating mycotoxins, you've just mixed them back in to the rest of the jam. Even if you did manage to kill the mold, the laced food could still poison you: mycotoxins are toxic chemicals produced by the mold and won't go away simply because the mold itself is (or appears to be). Also, you've now helped the mold spread, even if at first it appears to be gone from the mixing process. Where there's mold you CAN see, there's usually mold you can't see yet. This is part of the reason for the recommendation to cut an inch around any mold growth on foods that are generally considered to be safe to eat after the mold on them has been properly removed, like cheese. I have no idea about pickles, but if your jam has mold on top, the last thing you want to do is mix it into the rest of the jar. If you just have a couple tiny spots of mold on top of the jam, or on the jar above the jam, you can even completely remove the mold (generously - i.e. excise a little bit extra all around the moldy patch too), & the rest of the jam can be still good. However, your picture is of some odd looking mold. I wonder if it is really mold and not some other substance. If that is jam - marmalade? - that white stuff might be something else that separates from homemade jam if it is old. Some kind of pectin or sugar content coming out of solution. It's often a little crunchy, and does not smell or taste moldy, nor is it ever "furry". Whatever that substance is, (not mold but other whitish exudate from jam) I do mix it in with the rest of the jar. But you have to be sure it's not mold, or that would ruin the whole jar. If your picture is of pickles...I don't know what that white stuff might be. You assume it is mold, but actual mold in jam bottles are rather rare. 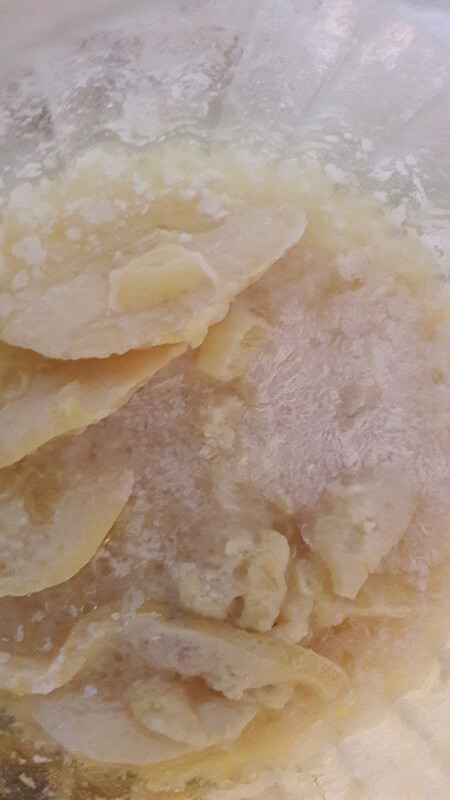 What you more often get is Congealed Pectin or crystallisation of the sugar crystals. Remember that sugar is very much a preservative just like salt. If you use the correct amount of sugar than the sugar will inhibit mold growth to a large degree. So unless there was truly negligent cooking going on, it probably isn't mold. For the jam (and honey), if it's crystallization, you can also heat the whole jar gently in a double boiler. Put the jar in a sauce pan with enough water to go up to the shoulders of the jar. Heat gently. Very gently. Stir if you can. This is iffy with commercial products because you can melt the plastic containers (and also of little value because they're usually not worth saving), but a good preserved fruit or a good honey is worth putting a little effort into keeping. Be careful to just heat it enough to break up the crystals (don't get it anywhere near boiling), any heat at all will do a little cooking which it really doesn't need (storing it in Tennessee over the summer is enough to cause deterioration). For food in an aerobic environment it’s probably always the case that these should be thrown away because of the health consequences that it can have on you. Home-made jam should be stored in a cool, dry place away from direct light and used within 12 months of making. Once opened the jar should be stored in the refrigerator and used within one month. We would suggest discarding any jars of jam that have mold growing on top. Tom Goodfellow's comment is incorrect. While some types of cheese are deliberately infected with mold as part of the maturation process (for example Blue Stilton) and are perfectly safe to eat. Eating other types of cheese which have had mold growing on it is a bad idea because this type of mold produces toxins which spread throughout the cheese. Cutting off the moldy parts will not remove the toxins. I was told this by a food scientist. Are bunya-bunya nuts safe to eat if the shells are moldy?